In global climate finance architecture, the Green Climate Fund plays a crucial role in channeling new financial resources to tackle the pressing adaptation and mitigation needs of developing countries. The GCF has raised the equivalent of $10.3 USD in pledges from 43 state governments, as of October 2016. 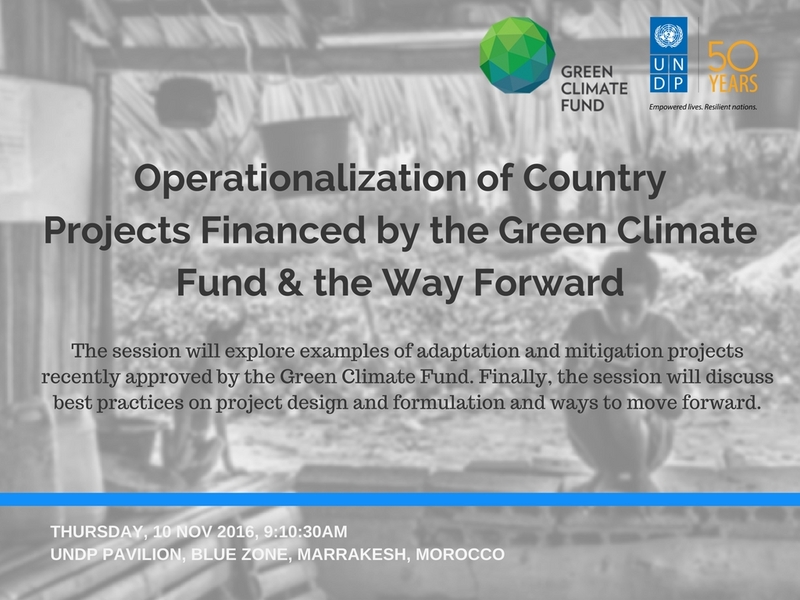 This session provided a space for the exploration of examples of adaptation and mitigation projects recently approved by the GCF. The session also discussed best practices of project design and formulation of strategies to move forward. Following opening remarks from Pradeep Kurukulasuriya of the UNDP, panelists from Armenia, Vietnam, Ecuador, Malawi, the Maldives, and Pakistan gave brief presentations on their experiences with designing and implementing projects developed with the support of UNDP and financed by the GCF. The projects in Malawi, Vietnam, and the Maldives are all concerned with issues related to water; in the Maldives, the project involved addressing a severe dry period in the country while Malawi and Vietnam’s projects were more centered around designing effective responses to increasingly intense weather events in vulnerable communities. The project in Armenia seeks to address Armenia’s intense fuel dependency by improving the energy efficiency of public and private buildings. Ecuador presented one of the first REDD+ related projects to be approved by GCF, aiming to reduce deforestation in the Amazon. Multiple countries noted that their approval process was greatly expedited by tying the project in question to their country’s NAPs. In spite of this however, nearly all of the countries emphasized the difficulty of effectively preparing a proposal for the GCF given how challenging it can be to collect and organize the relevant data, especially in countries already lacking in infrastructure. A question arose from a delegate from Uganda about how countries chose which one of their NDC priorities to focus on for funding and implementation. The panelist from the Maldives pointed out that their focus area is addressing water shortages as a result of the country’s dry spell, which is costing the government a great deal of money. Therefore, there is impetus from the government to find an alternate solution. In general, it was agreed that is is useful to align NDC priorities with government spending priorities, where possible and effective. Mr. Kurukulasuriya noted that this was part of a larger theme spoken to by nearly all of the panelists; that there tends to be bigger and faster success with project implementation when the project builds upon actions which are already underway. A Q&A took place, with the panelists discussing the importance of civil society as a partner in the design and implementation of projects. In some cases, especially in rural and scattered communities, civil society organizations are much more equipped to engage with those populations than a concentrated national government. Complementing this, the panelist from Ecuador noted that if given the opportunity to change something about their REDD+ project, they would facilitate more community involvement – especially the involvement of local and indigenous communities. Wrapping up the discussion, Mr. Kurukulasuriya noted that all of the projects presented by the panelists have already been approved for funding, but have not yet begun the implementation process. The projects will be nationally executed, with governments and NGOs carrying out the implementation process. In response, all panelists emphasized the need to make the process from application to approval to implementation more efficient and faster, so that countries can start working on projects as soon as possible.